You are here: Home / News / Kim Roy to retire! 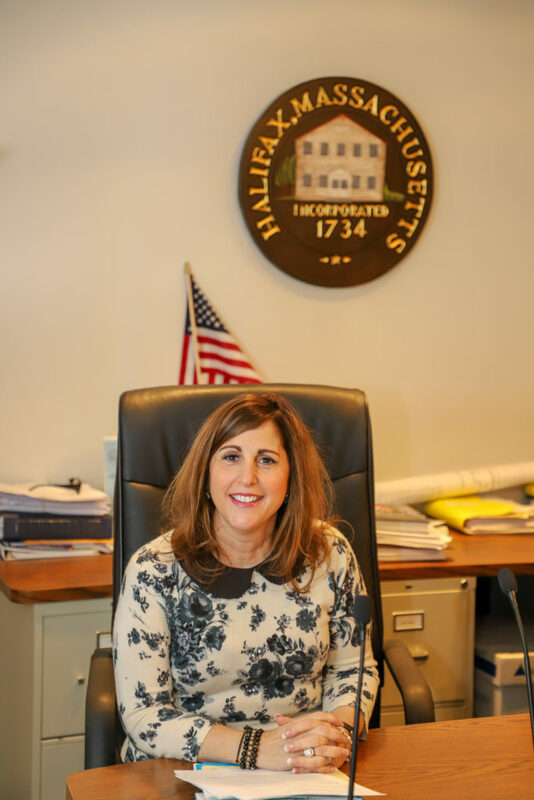 HALIFAX — “When my term expires in May … so will my service to the town,” said Kim Roy, the nine-year Halifax Selectman and town volunteer. She told the Express on Tuesday, shortly after she made the stunning announcement to town department heads. Roy, a Quincy native who came to Halifax in 1993, will move to Hull with her husband, Marc, in June. She said she is as surprised as many in town at the news, where she has become a fixture on numerous boards and committees. Selectman Tom Millias joked that Marc lets her do whatever she wants whenever she wants. But she said she loved working and began as a teller at the former Boston Five Cents Savings Bank. She quickly moved her way up the corporate ladder, eventually becoming a vice president, overseeing collections operations for the bank with a staff of about 45 working for her. She later went on to sell real estate, but, “I was a terrible real estate agent,” she said. She and Marc next bought a home in the heart of Halifax, within walking distance of Town Hall and across from the elementary school. Her volunteer life began after she had her first son. She said that in a way it was a distraction from a busy home life. Her service to both the town and committees and associations for the state is nothing short of prolific. She was a member of the Government Study Committee, the Fire Study Committee and is a current member of the Capital Planning Committee and Wage and Personnel Board. She has served as the selectmen’s emergency management liaison, planning for storms and working at the shelter during emergencies. “Kim does so much for our town. She’s on so many boards and committees, but what stands out to me is that we have a hard time finding volunteers for the shelter. Kim stays overnight, sometimes the only one there, serving meals, changing diapers and doing whatever it takes to get the job done,” said Fire Chief Jason Viveiros. At the state level, Roy was on the board of directors for the Massachusetts Municipal Association for eight years, appointed by Governor Patrick to the Local Government Advisory Commission for six years, president of the Massachusetts Association of Town Finance Committees, president of the Massachusetts Selectmen’s Association and is currently on the board of directors of the Massachusetts Interlocal Insurance Association, for the last five years. As part of her statewide volunteering, she once had the opportunity to drive Governor Michael Dukakis home, a highlight to her, because “subway Mike” needed a ride. Roy is a world traveler, having been everywhere from Iceland to Morocco, and shares her travels on social media. She has never lived by the beach, she said, but is looking forward to it and has a healthy respect for the ocean. “Jaws changed my life. You won’t find me in the water deeper than my knees,” she said, half-seriously. Roy has been no stranger to the ups and downs of life and exudes a “seize-the-day” attitude toward all of her undertakings. “People don’t understand how fleeting life is,” she said. Whether talking about her struggles, or the latest news around Halifax, Roy said she finds the humor in everything in life, and her outlook and laugh are infectious to those who know her. “It’s constantly in play when she’s in the room. She’s going to missed. I’m going to miss her,” said Millias. Roy has a reputation of being cautious with the taxpayer’s dime, but she says she is an independent (unenrolled), who is neither a Democrat or a Republican and has brought an independent perspective to the job of selectman. Roy said it frustrates her when people assume things. “I want people to understand where I’m coming from,” she said. Roy said she won’t get involved in politics in Hull, despite already getting encouragement in that direction from others in public life on the South Shore. “I don’t think I could ever remake the magic [of Halifax],” she said, barely able to get the words out through tears.